Abstract: As the latest model of Airwheel, Airwheel Q3 has dual wheels that offer a better riding stability. Its customized night riding set allows you to have night riding. With Airwheel Q3, you're free to enjoy portable and pleasant life. Concept-wise, the Airwheel is similar to a scooter, but with a crucial difference. Instead of having a platform to stand on in between two gyro-controlled wheels and a handle to hold on to, the Airwheel Q3 has you standing on two pedals either side of two adjacent wheels. Unlike the Airwheel X-series, this Q3 2-wheeled electric scooter has a dual-wheel design which can make your riding more stable. The Airwheel Q3 self balance electric unicycle is a trendy contraption that looks bonkers. It is fun, fast and thrilling to ride. It’s about to transform the way we travel, because it can get you to your destination quicker than your legs and give you a literal feeling of floating. 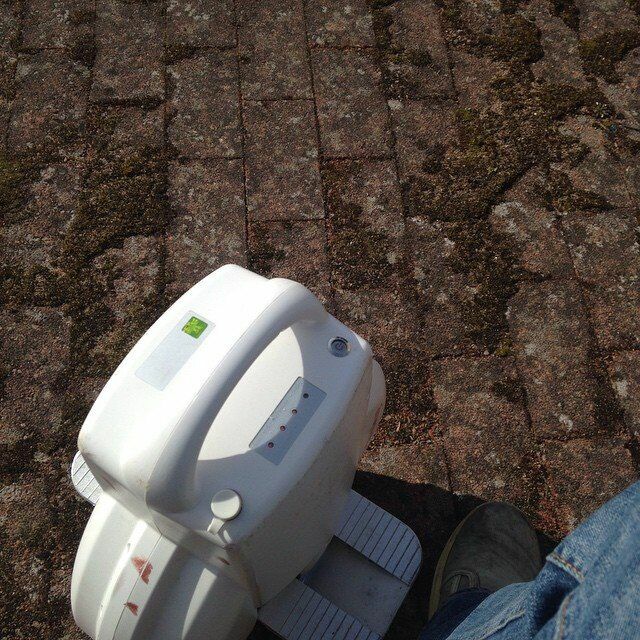 Hairbrained as it might seem, controlling the Airwheel is actually simple. To steer it, you just have to lean forward or backward while standing on pedals. The intelligent gyro system can sense the tilting signal and make the device go at the expected direction. When you come off it, it deactivates the gyro to stop the wheels spinning. Once mastered, the Airwheel is a huge amount of fun. You can ride Airwheel on different terrains as you wish. Wherever you ride with Airwheel Q3, you are sure to be the center of attention. There are many other worth noting features about the Airwheel Q3 2-wheeled electric unicycle. It’s very compact. It’s no larger than a briefcase and weighs only 13kg so you can easily take it in subway or on bus. Using a combination of gyroscope and attitude control stabilization, the Q3 is “self-righting” in the sense that it won't tip forward or backward unless you lean into it. The Li-ion battery of Q3 can last for between 12 and 28 miles on a single charge. On the chassis, there are a series of LEDs showing how much power you have in reserve. When power level falls lower than 15%, all four lights will blink and the buzzer will beep. The front end of the pedal will rise to force you to decelerate and eventually stop. What’s more, Airwheel Q3 has night light in front, which makes your night riding safer both to you and to others.